Christmas is always be awaiting moment for all of Christians in the world. The happiness during the Christmas will no felt completed without having your family. Sometimes you get confused to decide where you spend your Christmas without losing the Christmas moment with your family. You might feel bored to visit Vatican or Paris, so visiting Indonesia could be the best option. Although Indonesian is famous as Islamic country, remember that many Christians also live there. You can see how Indonesians honor each other, especially toward the different religion. Here is the list of places of where to spend your Christmas in Indonesia. This place is nicknamed the Vatican of Indonesia. Therefore, Natalan in Larantuka will certainly be an unforgettable experience. 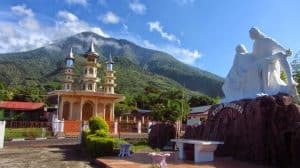 Besides being able to witness various Christmas traditions that are second to none, in Larantuka you can also visit various places of Christian pilgrimage scattered here. One of them is the beautiful Mater Dolorosa (Mother of Sorrow) Statue with a mountain setting. After celebrating the birth of Jesus on Christmas Eve, you can see the beauty of the land of Larantuka. Larantuka itself is a city that has mountains and beaches as well as the sea. You want to go to whatever, just choose it. You can try to take a boat to Adonara Island on the other side, just by paying Rp. 25-30 thousand one way. One of the highlights is the ferry port, where you can see the sea and busy loading and unloading. Christmas is a day that is always awaited by residents of this city. How come? 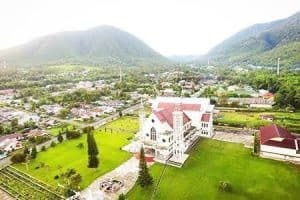 Most of the population of the city of Manado is Christian. The city has a very different atmosphere before Christmas and New Year. 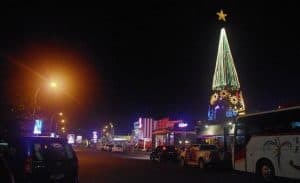 Manado people are so enthusiastic about welcoming Christmas. 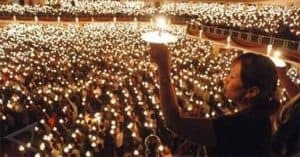 The atmosphere of the Christmas celebration has begun to be felt even since September or October every year. Around November, the shopping center has begun to clean up to display Christmas ornament ornaments and echo the Christmas song as if to remind the public that Christmas is near. Don’t forget to go to the Christmas Festival there. You will see an exciting show. Who knows, you will meet the real Santa Claus right there. Although Bali is well known as Hindu island, the Christmas celebration here is stunning. In Bali, just before Christmas, there are many churches that preen with Balinese penjor decorations. Besides penjor, there is also “ngejot” tradition during the Christmas celebration. Ngejot is a tradition of sharing food in Balinese society. When Christmas arrives, usually Christians cook Balinese specialties and distribute the food to diverse Hindu neighbors. These two habits of course can keep people’s tolerance diverse because they teach mutual respect. By visiting Bali during Christmas, you can also go around Bali to see its beautiful beach and nature. Your year-end-holiday will be well spent. As already known, Yogyakarta is one of the cities of art and tradition in Indonesia. So it’s not wrong at every religious celebration to be celebrated with traditional art. During the Christmas celebration the priest and priest lead the Christmas service using the Javanese English language. Not only that, usually priests or priests also choose to use typical Yogyakarta clothing such as beskap or blangkon. Usually, the shadow puppet show also enlivened Christmas. Usually this shadow puppet has a storyline with the theme “Birth of Jesus Christ”. In addition to other traditional shadow puppets in Jogjakarta, they visit each other’s relatives’ homes at Christmas day. Fireworks are always synonymous with New Year’s Eve. But in Ambon, you will find the most festive and spectacular fireworks on Christmas Eve. 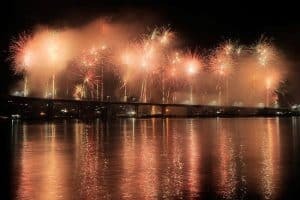 Even, it is said that fireworks at Christmas in Ambon are the most stunning in the whole world. Besides, there is also hundreds of Santa Claus that will come to every house in Ambon to give a surprise gift for children. Don’t forget, too, that Ambon has good places to visit to spend your year-end holidays. This will be a very exciting and fun family vacation spot. 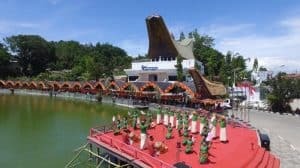 The Lovely December annual event in Toraja is also a series of Christmas celebrations. This annual festival is a cultural and tourism festival held in Toraja. The Biasnaya festival was opened with striped buffalo cuts in early December, then enlivened with various competitions. This annual fetish is quoted with the Lettoan procession. This procession is the process of parading pigs as a symbol of the three dimensions of human life. By vacationing in Toraja at Christmas, you will not only get knowledge about different Christmas traditions, you will also visit magical places that you will only find in Toraja. As a place with the nickname ‘City of a Thousand Churches’, surely the festive Christmas here will be very lively. 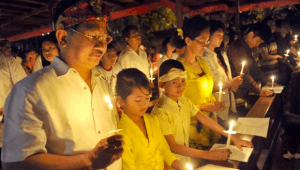 Welcoming Christmas, Catholics throughout the Paroki, Ruteng, East Nusa Tenggara, have their own traditions. Some of them enlivened the Christmas Eve celebration by lighting lamps from bamboo with kerosene fuel. The lamp was installed at the church gate. You will also see 100 bamboo lamp lamps installed at the 200-meter-long gate of the Church of Saint Theresa of Jesus. In addition, Catholics also held the tradition of “Embong” on Christmas Eve. The Embong tradition is a mother’s song to comfort her child to be calm, not cry and fall asleep. The city which is famous for this flower parade is a place of cool air with beautiful mountain scenery. 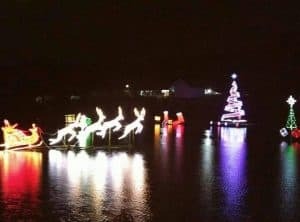 In 2016, residents of Tomohon celebrated Christmas by flocking to Lake Sineleyan to see the ornaments of colorful lights forming Santa’s character as if they were crossing a lake. He said, every year there will always be a big event held to celebrate Christmas. If you are interested in celebrating Christmas with a new atmosphere, you can take your family to this city. Don’t forget that the city has cool and calm weather that might heal your mind. Those are recommended places you can visit for your Christmas celebration. Don’t forget to take your family there. It might be your unforgettable Christmas moment during your lifetime.